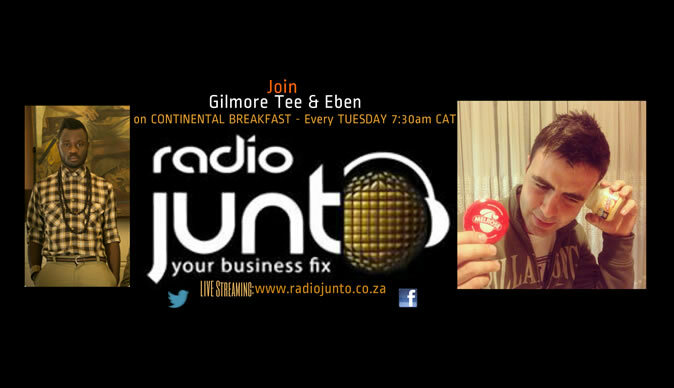 As from Tuesday the 24th of September 2013, Gilmore Tee will be Co-Hosting Radio Junto's Continental Breakfast with Eben Niemann. Every Tuesday, 7:30am CAT, Gilmore Tee & Eben will be heard on the station and this sets a new era for the Zimbabwean Global Citizen. The Radio Debut will see Gilmore Tee mixing lifestyle and inspirational topics on a very entertaining note on the South African radio station based in Gauteng. Gilmore, who recently was nominated for the Style Icon Award of the year at the Zimbabwe Fashion Week Awards 2013, is set to continue working on Radio after this debut and possibly have a solo slot. "I love talking and Radio has always been something on my cards. Having this opportunity on South Africa's Radio Junto is just a blessing. Of course, I would like to thank Zimbabwe's Radio Dialogue for giving me the platform when I was in high school," said Gilmore Tee. Radio Junto is a Visual Radio broadcaster that has embraced internet to harness the need to address young people with entrepreneurial spirit. The ethos of the station lies in identifying future trends and opportunities that are beyond the bend and implementing strategies today to address tomorrow's needs and as such a huge opportunity exists in broadcasting to a worldwide audience by engaging in progressive debates. With its presence online, the focus is on entreprenership, motivation and socio-economic development. The mission is to become an influential voice in the business sector across Africa and the world. The station which is based in Northwold, Randburg, Gauteng, South Africa, broadcasts 24hours per day and 7 days a week. The station has partnered with Sasol, Anglo American, South Africa's Departments of Labour, higher education & training and basic education, Apple Green International, Eskom, Seda & Johannesburg Water. The Co-hosting by Zimbabwe's Gilmore comes as no surprise as he is a Social Entrepreneur himself, so he has the qualities and is in a position to be part of the team. Make sure you tune in or catch the station on LIVE Stream: www.radiojunto.co.za and also give feedback. "I look forward to sharing my knowledge and quirky personality with every listener, and together with Eben we will make sure you enjoy listening to every bit of Continental Breakfast every Tuesday on Radio Junto," said Gilmore Tee.